The Hotel Meyrick is without doubt one of the classiest venues in Galway. 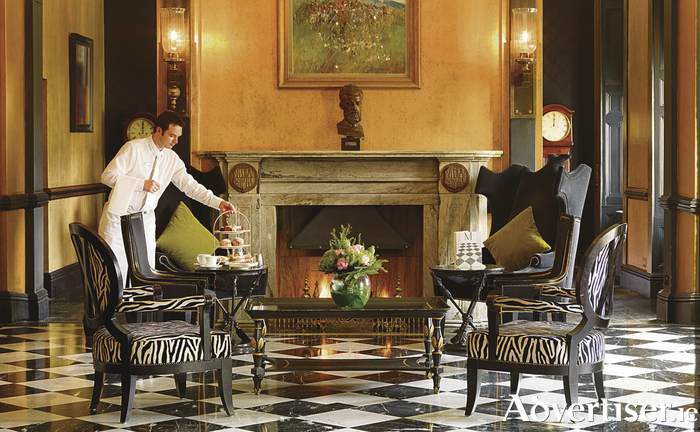 On walking through the door you are greeted by a roaring fire in the lobby, and the place simply exhudes serenity. The location is excellent with Eyre Square and the delights of Galway city literally right on the doorstep. The hotel is also adjacent the bus and train stations, for those who wish to leave the car at home and you can happily while a few days away inhaling the delights of Galway city, without needing to drive anywhere. There are some exceptional deals running at Hotel Meyrick for the autum/winter season. The Sunday Saver package, which includes a two night stay with check in on Sunday night, a table d'Hote dinner in No 15 on the Square on a night of your choice, and full Irish breakfast each morning, can be purchased from €104 per person sharing. There is also an Overnight Stay & Dine package which encompasses an overnight stay, with a table d'Hote Dinner in No 15 on the Square, and full Irish breakfast. This treat can be purchased from €161 per room. These are really exceptional deals for a hotel of this calibre, not to mention the location, therefore we felt it would be remiss not to go along and sample all the Meyrick has to offer. And we certainly were not disapointed. It is no understatement to assert that the food at Hotel Meyrick is amazing. It is clear from the first bite that only the freshest ingredients of the highest quality are being used by the kitchen. Dishes sampled included a gorgeous Caesar salad, and for those of you who enjoy a salad, you will know how difficult it is to perfect the Caesar salad. Well the Meyrick have got it spot on, with lashings of fresh crispy chicken, bacon, and parmesan, it is a truely mouth watering dish, which only whets the appetite for what is to come after. And it got better, the Irish beef fillet - which was melt in the mouth tender - was undoubtedly the nicest steak I ever tasted. It is the type of dinner you will still be thinking about a week later. It is a hotel with so much character and charm, one could easily stay for a week and find ample entertainment and shopping in the heart of Galway city. It is just such a relaxing experience. The luxurious room overlooked Eyre Square, and it brings home that it really is an unreal location from which to soak up all Galway has to offer. Wake the following morning feeling refreshed and enjoy a full Irish breakfast. Similar to the experience in No 15 restaurant, everything is so tasty and of the highest quality. All kinds of dietary requirements are catered for, and if you are bold and ask for a sneaky pancake there is no problem. With a happily full belly, and for the ultimate in pampering, hop into the elevator to Level five at Hotel Meyrick, where the Square Spa and Health Club promises an experience like no other; overlook the Galway skyline while relaxing in the outdoor hot-tub. It is also worth taking note that the Square Spa offers a whopping 50 per cent off all treatments on Monday and Tuesday, so it is well worth checking out the extensive treatment list which includes a full range of facials and massages. These fabulous treatments are exemplary value at half price. All that will no doubt whet the appetitite again, so why not indulge in hot chocolate or some afternoon tea in front of the fire, or indeed sip a cocktail in the Gaslight Bar & Brasserie. Another novel before dinner offering at the Gaslight Bar & Brasserie is a gin tasting. Gin has exploded in popularity in recent years and Hotel Meyrick is the place to go to enjoy some artisan gin. This author sampled the Portuguese Gin Sul, the Spanish Gin Raw, and the Irish made Short Coss. These are quality gins married together with different mixers and flavours and it is a really enjoyable experience. It is lovely to hear about these smaller breweries which are churning out amazing products, not to mind enjoying the tipple itself. There is something very satisfying about a quality gin and tonic, and its not hard to see why it is making such strides as a social drink. Speaking from experience, you are guaranteed to enjoy the perfect winter break at Hotel Meyrick.